ORLANDO, Fla. -- Okay, so you think you've got game and know how to score. Room off the tee at Hunter's Creek Golf Club allows for the "bombs away" mentality. And you're looking for golf courses that not only will test your physical skills and course management but also will deliver hours of entertainment. Then if you're ready to go "mano a course-o," go to Orlando to confront any or all of these six "bruisers." Just the name of Dubsdread Golf Course should be reason enough to accept this first duel. The intriguing name was coined shortly after the course opened in 1924. A group of men played the course regularly and complained vocally about its difficulty; thus, their ignominy inspired the moniker. Redesigned in 2008 by Mike Dasher, Dubsdread is a par 70 at only 6,153 yards from the tips, but, according to Assistant General Manager Ernest Collins, "the allure comes from the ultimate in risk/reward shot making: from how narrow the fairways are, how well placed the 35 bunkers are, how true the quick, postage-stamp greens roll, and how the layout with water on nine holes is considered 'sneaky' and 'sneaky long.' People just love this great little golf course." If Dubsdread requires ingenuity off the tee, Hunter's Creek Golf Club, at a daunting 7,432 yards all the way back and the longest course in Orange County, is a "grip it and rip it" delight. Rated as high as 37th in "Golf Digest's" Top 75 Public Courses to Play, Hunter's Creek has been the host to U.S. Open qualifiers, PGA Tour qualifiers and many FSGA events. The 76.1 CR and slope of 137 attest to the course's character. The fairways are spacious and rolling as they pass among the towering pines and the 13 lakes, but the water is never in the golfer's face -- just there to keep him honest. The TifEagle greens, with many subtle breaks, are equally spacious, run about 10 on the Stimpmeter and are protected by two or more sand traps. U.S. Open champ Graeme McDowell had this to say about his round at the semi-private Timacuan Golf Club. "It is a great layout with a links-like feel to it. It can be testy in places if you get off the beaten path, but it is a very fair course. And it is in great condition." Head Professional Nate Stevenson added, "Timacuan, named after the native Americans who were here before the Seminoles, is a superb Ron Garl design with a Bobby Weed renovation. It is a pure layout and always rated among the top 20 golf courses in Florida. From the tips at 7,047 yards, it rivals any course in town. The front nine offers rolling terrain, unusual for this area, and the back nine encompasses wetlands and moss-draped oaks. This course is all about strategy." The final three bruisers are operated by Marriott Golf; therefore, the golfer can count on an upscale experience from the moment he reaches the bag drop. Architect Steve Smyers, in consultation with Nick Faldo, has designed Grande Pines Golf Club to be "the thinking player's venue," according to Head Professional Charles Sheppard. With its black tee length of 7,012 yards and CR of 74.1 and slope of 143, Sheppard said, "There's plenty of driving space off the tee, but the closer you get to the green, the tougher the situation becomes. The elevated, multi-tiered, and undulating TifEagle greens are perfect and fast but have run-off areas and deep, dramatic bunkering." A Certified Audubon Cooperative Sanctuary, Grande Pines weaves around tall pines and in between lakes. Smyers' layout does allow for lay-up and safer routes to the pin, but the most fun will come from challenging the length, the hazards, and the obstacles that Smyers has put in the way. 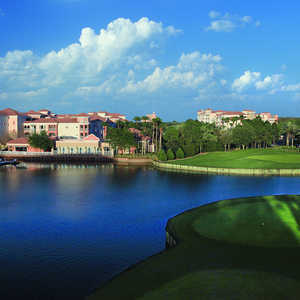 "Orlando Magazine" calls MetroWest Golf Club, a Robert Trent Jones Sr. Signature Course, "the best course in Orlando." Links Magazine calls it "the Southeast's finest example of the Master's work." Certainly it represents the traditional golf course architecture that so many players appreciate. MetroWest, at 7,051 yards with a CR of 74.1 and slope of 132, has been the host of U.S. Open and Florida Open qualifiers. "Yes, it is a phenomenal layout," Head Professional Chris Jones said. "The elevation changes of 200 feet are not typical and keep flat lies at a premium. It is forgiving off the tee, but the fairway and greenside bunkering -- 78 in all -- require some shot precision. Water comes into play on seven holes, and the fast Bermuda greens are relatively small and well contoured." 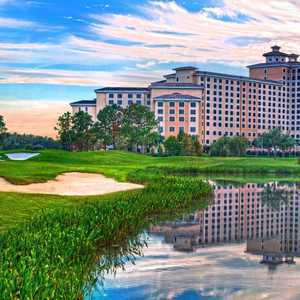 The Ritz-Carlton Golf Club, Orlando, Grande Lakes, is a worthy grand finale for the bruisers. Home of the current Father-Son Challenge and former home of the Buick Scramble Championship, this Greg Norman Signature Course has been carefully designed within the pristine natural environment, and, like Grande Pines, is a Certified Audubon Cooperative Sanctuary. "At 7,122 yards from the Blacks [CR: 73.9; S: 139], this is one impressive layout," Head Professional Kirk Baker said. "The tee shots are wide open, but the trouble comes from water on 14 holes and well trapped greens, usually with two or more bunkers. The large greens, running 10-12 all year on the Stimp, have subtle undulations and never seem to afford a straight putt. Holes 14-18 provide an unbelievable finish and will make or break the round." There you have it, six of the more redoubtable courses in the Orlando area. Take your "A" game and go. These bruisers are just waiting for you.